If you are having pain in your big toe and feel tenderness and inflammation, a likely condition you may have is sesamoiditis, a form of tendonitis. 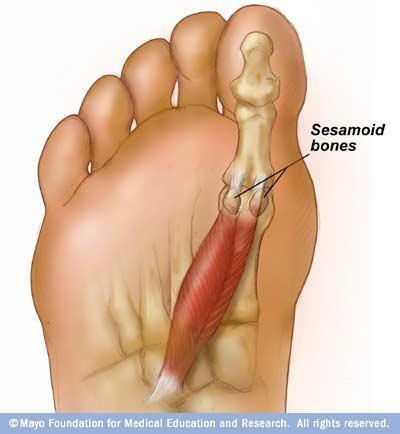 Sesamoiditis is an irritation or inflammation of the sesamoid bones, which are tiny bones within the tendons that run to the big toe. This type of condition is most common in people who play tennis, baseball, basketball. Runners and ballet dancers are likely to be diagnosed with condition as well. Anybody who increases their activities increases their chances for this condition. Also, people with high arches are at risk for sesamoiditis. If you frequently wear high-heeled shoes this can be a contributing factor as well. The pain may develop gradually but with a fracture, pain will be immediate. Also, swelling and bruising may or may not be present. It’s common that you will experience difficulty and pain in bending and straightening the big toe.